The Floor Mat Company is a great resource for rubber flooring. They have a large inventory of rubber flooring items that can be used in places like gyms, garages, and kitchens. Their website is very easy to navigate. Each type of flooring is divided into different categories. The different types of flooring are neatly organized according to the type of application it is meant to be used in. The types of flooring that are available give you, the customer, a good plate of options to choose from. They have custom fabricated rubber flooring rolls, easy to install interlocking rubber tiles, and rubber drainage mats for wet and messy places. One thing that sets the Floor Mat Company apart from the competition is their inventory of rubber and coir doormats. Doormats are a common and everyday part of any household or office, a fact that the company recognizes. As a result, their line of doormats features a great combination of eye-catching aesthetic value with high-quality cleanliness function. 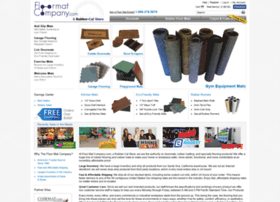 The staff at the Floor Mat Company are very helpful and very knowledgeable about their product. This company makes it a point to make itself readily available to the customer, so take advantage of it in case you have in-depth questions that would be best answered by an expert. Copyright © 2019 Rubber Flooring Blog. All rights reserved.